Uh OH...We seem to have a problem. I was wrong. That old horse got tired and gave our Chevy one hard kick. This is where it landed. 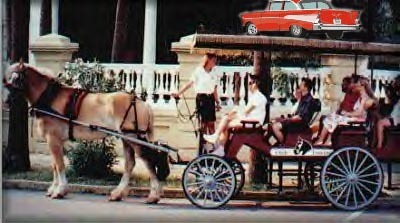 Oh, well, the carriage tops are strong, but while we tour some more, y'all be thinking about how we'll get our car down. 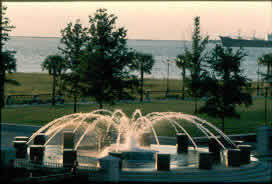 The Pineapple Fountain at Waterfront Park welcomes us as we travel past. 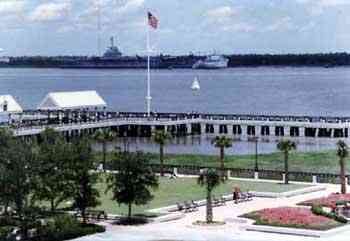 On this quiet day at Waterfront Park, a lone sailboat cruises Charleston Harbor. 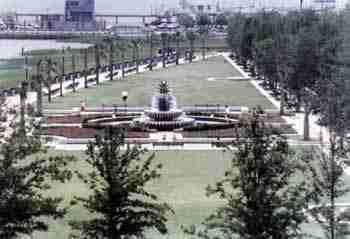 On a hot day, Vendue Fountain is a popular place. We're here just in time to see the opening ceremonies of the Spoleto Festival USA, a world-class art festival. 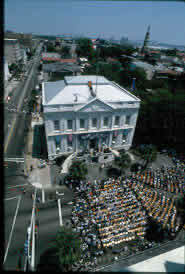 It always begins at City Hall. 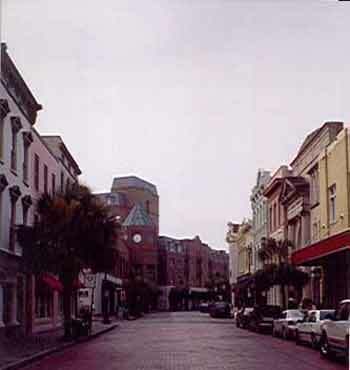 This is King Street, Charleston's premier shopping district. Sorry, but we've arrived before any stores are open. 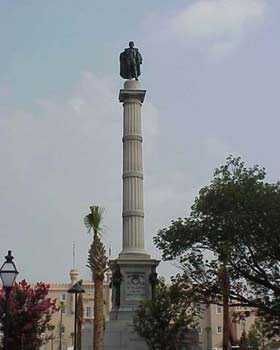 This statue of John Calhoun stands in Marion Square. Calhoun, born in South Carolina, was a statesman, Congressman and Vice President under John Quincy Adams. 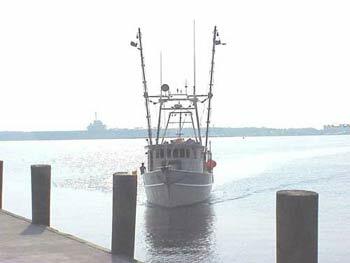 We arrived just in time to see a fishing boat docking at Maritime Center. 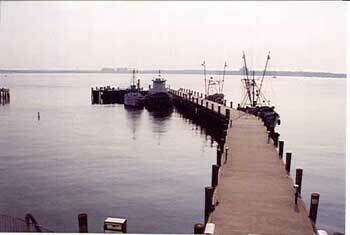 The water is calm this morning at Maritime Center. 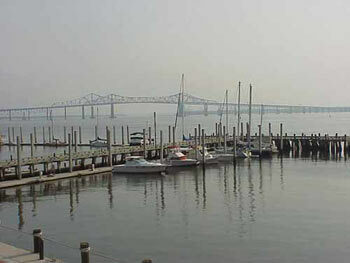 The Maritime Center has great views, and is a very popular spot for special events. 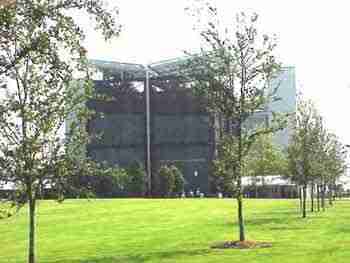 The South Carolina Aquarium tells the story of the Appalachian Watershed. 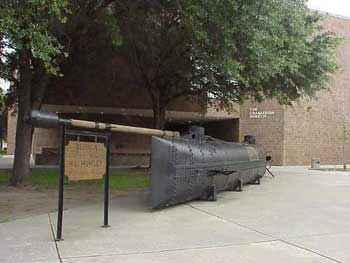 This is a replica of the Confederate submarine, Hunley. It stands in front of the Charleston Museum. 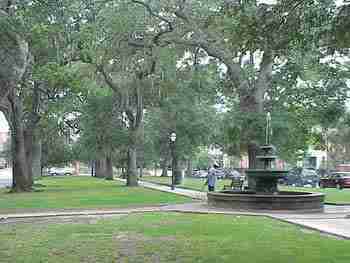 The peaceful fountain and stately trees make Wragg Mall a great spot for a walk or rest. 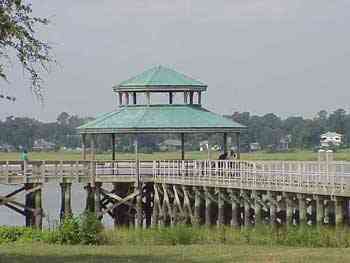 The Brittlebank Park pier looks like a great place to daydream or try your luck at fishing. 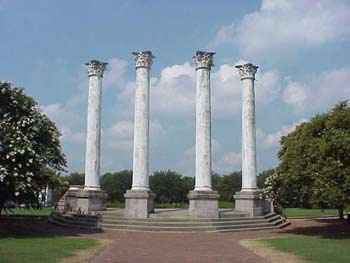 In Cannon Park, we can still see the columns from the Charleston Museum which formerly housed the museum collection. 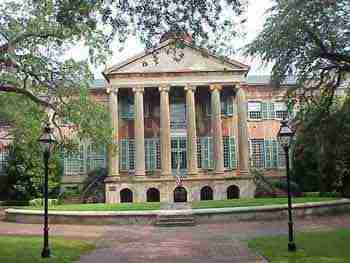 This historic cistern serves as the center of the College of Charleston campus. We have spent the entire day touring Charleston. 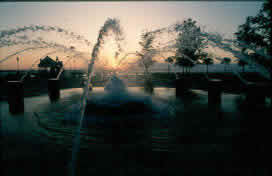 This sunset at Waterfront Park signals the end of a perfect day. There is so much more of Charleston to see, but maybe on another trip for we do have to move along. Anyone figure out how to get the Chevy down? Click on the little flag, and we'll solve the puzzle for you.